A little over a year ago, my mother and I leapt at the opportunity to make a whole lemon tart featured in the New York Times and ended up with one of the most caustic, inedible things I have yet to make on this site. And people, with an ever-growing category of “disasters,” that is no small feat. We received a lot of comments on that post ranging from sympathy to eye-rolling (as one of this woman’s recipes had previously felled another reader) but the bulk of them came in two veins: You should have used Meyer lemons and you really ought to make a Shaker Lemon Pie next. As for the Meyer lemons, a milder and thinner-skinned cousin of the lemons we have readily available in the U.S., these comments made me dig my heels in, oh, just a little. Because while Meyer lemons may have yielded a better outcome, this was not my complaint: my complaint had been that the recipe said that Meyer lemons were an option not a requirement and I held the recipe to this and it nearly cauterized a hole in the roof of my mouth. But there was another reason that I knew that it would take more than Meyer lemons to save this tart, and that, my friends, is a simple matter of proportion. The Evil Tart’s citrus to sugar ratio was eight whole lemons to three-quarters of a cup. The standard Shaker Lemon Pie recipe uses two whole lemons to two cups of sugar. You don’t need to be a math whiz to figure out why that all went to hell in a handbasket. Isn’t it great how long I can stay–pardon the pun–bitter over a recipe? Nevertheless, I digressed. The disaster of last year’s lemon tart had me in no way less curious about making this Shaker Lemon Pie of which so many of you spoke, and yes, I was determined not to test fate and planned to make it only if I could find Meyer lemons. Except, I never did. Maybe I just missed the week they were at the store (they have a notoriously short season) or maybe I just went to the wrong stores, but the Meyers, they never showed up. I even emailed South Texas Organics to ask when their Meyers would come in and do you know what they told me? They’d come and gone weeks prior. And then I sat home and cried and cried until, well, a small miracle came to pass. A couple weeks ago, a reader in San Francisco sent me the sweetest note. She said that this here smittenkitchen made her day (aww) and that she wanted to send me some Meyer lemons from her backyard trees as a thank you. I am really, really not big on accepting free gifts, so I said no a couple times, and she insisted and then I tried to send her something from NYC as a thank you and she said no thank you and then I caved: I really wanted those lemons! I am weak, but I am also lucky. And so with no further derailments, I was finally onto my Shaker Lemon Pie. What is this, you may be impatient to know 500+ words later? The Shakers, a religious sect whose communal societies spread from Maine to Ohio in their mid-1800s heydey, were a notoriously thrifty bunch, not even wishing to part with the bitter lemon peels when they made a pie. The pie that is their legacy uses paper-thin slices of whole lemons, macerates them in sugar for a good while and mixes them with eggs to form a most-amazing pie filling, part marmelade and part curd. Though it requires some futsiness–I think a mandoline or the knife skills of a sushi chef are essential here–it really couldn’t be easier to make. It is not for the feint-of-lemon heart, however. This is only for those who like grown-up flavors like candied peels and lingering bitterness in their fruit, and I say this because even though I used a mandoline and the finest of Meyer lemons, I still think I should have shaved the lemons thinner to mellow the rings out a bit. I think using Meyer lemons is essenetial for this recipe, but the good news is that you’ll only need two. Nevertheless, whether you’re a lemon fanatic or have come into a supply of Meyers, if you aren’t sure you’re quite ready for this pie, I wanted to round up some of my other favorite lemon recipes on this site. Turns out, we’re quite the lemon junkies around here. Pre-rehab, of course. There are about as many Shaker Lemon Pie recipes out there as there are people who love it, but I have found them all largely the same–except for this one, which I’ve adapted from Saveur Magazine, which uses the same lemon-to-sugar proportion but adds some butter (always welcome), a little flour and insists that you let it macerate for almost a day. I will add to this that you should slice these as thin as your mandoline or adjustable-blade slicer will let you, and don’t be frightened if the rinds are still a bit bitter–it is all part of the pie’s charm. Thoroughly wash lemons, then dry with paper towel. Finely grate lemon zest into a bowl. Using a mandoline, slice lemons as paper thin as you can get them; remove and discard seeds. Add slices to zest and toss with sugar and salt. Cover and set aside at room temperature for 24 hours. Preheat the oven to 425°F. Roll out half the dough 1/8 inch thick on a lightly floured surface, fit it into a 9-inch (1-quart) pie plate, and trim the edge, leaving a 1/2-inch overhang. Mix the macerated lemon-sugar mixture with eggs, melted butter and flour until combined well. Pour in to prepared pie shell. Roll out the remaining dough into a 12-inch round on a lightly floured surface, drape it over the filling, and trim it, leaving a 1-inch overhang. 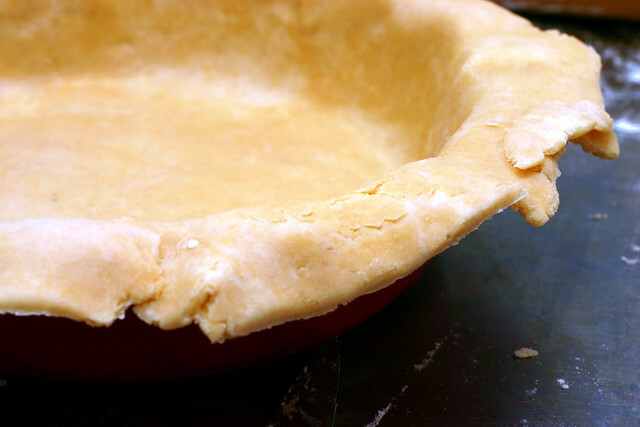 Fold the overhang under the bottom crust, pressing the edge to seal it, and crimp the edge decoratively. 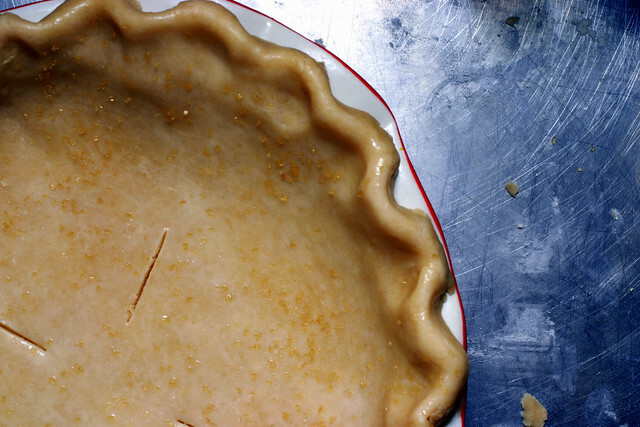 Beat one egg white until frothy and brush over pie crust, then sprinkle with coarse sugar. Cut slits in the crust with a sharp knife, forming steam vents, and bake the pie in the middle of the oven for 25 minutes. Reduce the temperature to 350°F. and bake the pie for 20 to 25 minutes more, or until the crust is golden. Let the pie cool on a rack and serve it warm at room temperature. More bitter, actually. Well, not in sugar level, but the rinds are definitely more noticeable than I found them in the Whole Lemon Tart. your pie crust is so beautiful! oh, if i could just have your crust skills! Wow that looks good. YUM! I’m coming over! Yummmm!!! Looks delish.I absolutely love this site. Thank you for all of the cooking, eating, and posting that you do. Hi, I check your blog daily also and it always makes my day. I just thought I would mention that if you freeze the lemons first it makes them easier to slice thin (I use this trick when making marmalade, and would claim it as my own except I came across the suggestion when making the shaker lemon pie from the Tartine cookbook). Thanks for another great entry. I’ve been enjoying this site but I didn’t realize there was a whole disasters section until you mentioned it here. Now I can’t get away. It’s like the opening weeks of American Idol, I hate myself for liking it but I can’t not watch. Completely not related to cooking, but I really like the table cloth/napkin that the whole lemons are sitting on. They were super-cheap and cute at Crate and Barrel. (Who is, whoops, an advertiser all over this page, but yes, I did actually pay for these.) Unfortunately, I realized shortly after purchasing them that I really don’t have a pressed-fabric kind of kitchen (i.e. it gets too messy in there). But they are pretty. Sweet Holy Moses on a Popsicle Stick! I’ve been lurking at your site for many months. And I usually drool over the pictures. But this time, you’ve gone too far. My wife is the baker in the family, but if I can’t talk her into making this for me, I’ll have to roll up my sleeves and make it myself. Ooooh I am a sucker for a good lemony dessert. When the balance of sweet and sour works, it’s just… heaven. In pie/tart form. FYI, I think I saw Meyer lemons at Manhattan Fruit Exchange in Chelsea Market this past weekend. At least I hope I did, because now I want to pick some up and make me a pie! Your pie beats my lemon pie out of the water any day. Nice job! And I LOVE meyer lemons. I’ve been using them quite a bit lately. Thanks for the beauuuutiful photos. GAH!!!!! I miss Meyer lemons. I wish I never sold my house and moved across country where I can’t grow them without a green house. Oh, this looks delicious. I have a thing for slightly adult marmalade-y flavors, especially when they involve meyer lemons. And your pie crusts are beautiful. How do you do it? Stunning. 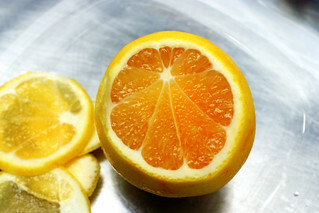 I’m now starving and sucking the sides of my cheeks with that lemony feeling one gets when looking at citrus. I don’t know if this is food or art – if I should eat it or hang it on the wall; maybe hang it on the wall, then eat it. wow this looks wonderful. i have never even heard of this kind of pie. If i can get my hands on some meyer lemons than i must make this. This pie is so for me—I LOVE bitter marmalade, especially meyer lemon marmalade, and usually have to make my own to get it bitter enough! And I just saw Meyers in the store today–yay! I love the second picture – it looks like the lemon is kissing the other one on the cheek! I wish I had known! I would’ve sent you some Meyers. I’ve been using them in my scampi sauce and other pasta dishes. Divine. Our meyer lemons are calling out to be picked. This is the perfect recipe for them. We’ll give it a try and make sure about shaving them thinner. Thanks for the advice! What a wonderful thing a kitchen is. I cannot wait until I have my own again. 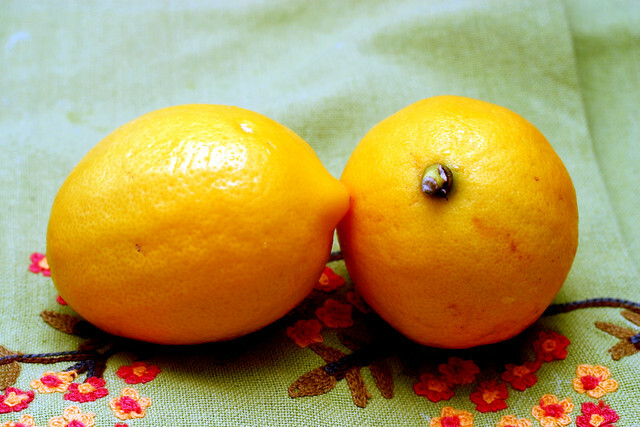 I first heard of meyer lemons last year when there was a wonderful recipe for valentines day in the LA Times. Meyer Lemon Posset This was the simplest and most wonderful desert ever. You can take a look at it here at Arte Culinara. I had planned to use regular lemons and had placed a bag in my cart when I noticed a package of some strange looking oranges… The package said Meyer Lemons, and it took a moment for me to realize that these were what the recipe called for. The results were amazing. Must make pie. Must thank Deb. Must dream of debs pastry skills. At least I can pass on a meyer lemon tip for you. The meyer lemon marmalade recipe at Gourmet is Stellar. Very very good. But you don’t have to hand cut for days. I am the rogue cook who posted that you can chop all those lemons in the Cuisinart. And while they will not look as pristinely beauteous as hand cut – they will TASTE as beautiful. And you will certainly be a happier and less lemon chapped cook. Short season, you say? I’ve got a Meyer tree outside my window here that never stops producing. Never. It’s got flowers and fruits, both, year round. If you ever need Meyers, please. Email me. Or if you ever visit LA. I’ll send you home with with dozens. I know you can take them in your suitcase, because we had a friend visit from New York recently, and she took lots. She’s coming back this month – we’ll send her with more. I still havent used meyer lemons. it is getting to be a source of foodie-embarrassment. Like other commenters, I too was delighted to find a section on disasters. I have posted a few of my own horror stories, and sometimes it is both soothing and educational to hear how others have also gone awry. Deb, this looks divine. And I love lemons. I’m just not sure that the lemon pith and I can co-exist nicely together. So thanks for the other recipes. By the way, the Ina Garten lemon pound cake recipe IS divine. I just re-read your notes about it, about the lemon syrup rolling off the cake. I use a pastry brush and just brush it onto the cake. It soaks right in and works perfectly every time! Sounds outstanding, although I’ve never had a Meyer lemon. I’ve actually seen them for sale at the farmer’s market here, I should pick one up and try it. It sounds like such a specialty item. The recipe sure sounds fairly easy, maybe a Meyer lemon meringue pie with a more traditional crust would be easier? Deb, you have to buy me a gym membership!! Preheat oven to 170Â°C (325-350Â°F). Separate the whites from the egg yolks. Beat yolks with sugar until frothy. Add almond butter and lemon juice, stir vigorously, then add almond powder, flour, baking powder, and lemon zest. 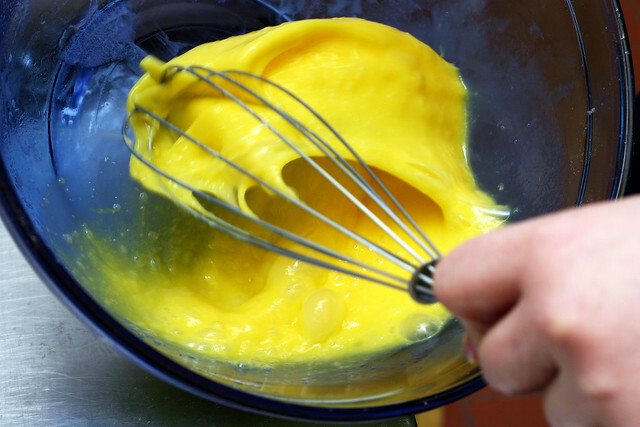 Beat egg whites until stiff, then delicately incorporate into the batter. Pour into a greased 9-inch cake or tart pan and cook for approximately 25 minutes. Allow to cool completely before serving…sprinkle with raspberry sauce, powdered sugar, or mint leaves (or lemon icing!). Hey, what’s with all the Kraft advertising? I desperately love lemon curd… but I’ve never seen Meyer lemons here in England. Hmmmph. Will have to ask my organics people if they ever get them in. Hear, hear Erin! We European residents are feeling sad about the absence of Meyer lemons in our lives. I think the closest thing I could get here would Amalfi or Sorrento lemons from Italy. Now I’m going to have to coerce one of my Italian colleagues into smuggling me some to Amsterdam, because I’m going to obsess about your pie until I get my hands on some suitable lemons! this looks divine. anything lemon is fine by me! You are lucky, and the woman who has this tree in her backyard is blessed! I just discovered this pie the other day and put it on my to do list. It looks so good, I might have to do; sooner than later. I just whipped up some homemade lemonade, all I need is a slice of pie. yum — but when i start to feel guilty about waste, I think I’d rather compost than eat lemon peels! Although I’ll keep this recipe in mind! I wanted to let you know about a quicker and just as delicious edition of Shaker Lemon Pie. It’s from the April 2008 volume of Cook’s Country magazine (the glossy sister of Cook’s Illustrated). 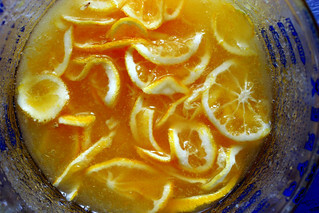 The recipe calls for simmering the sliced lemons with water in a sauce pan, and then draining the water off, thereby eliminated most of the bitter pithy flavor, but preserving the bright lemon flavor, and saving you from the 24 hour macerating period. I didn’t even use Meyer lemons. This pie was even better the next day and homemade whipped cream really elevated the divine lemony flavor. That is the recipe we use and love it! Served with whipped cream too. Meyer lemons from our back yard. This look go good. Maybe I can get Meyer lemons at Trader Joe’s or Whole Foods. I’m going through a lemon love fest now, so I have to add this to my “to make” list. Thanks! Looks delicious! I love anything with lemons! Deb! This looks phenomenal. Trader Joe’s had Meyer lemons and I just bought a mondo bag of blood oranges, too! Got any blood orange recipes to pass along? I’m making the pie this weekend. Must. Happen. I can never look away from a lemon dessert. For those of you who live or work in NYC, I just purchased Meyer lemons at the “Garden of Eden” on 23rd Street. I can’t wait to try this recipe. I love your site Deb. Oh, I love you. But you’re not making my life any easier… I’m hunting for potluck recipes! And I love my some lemon pie… And have heard such good things about Shaker Lemon Pies. Maybe I’ll try it anyway… Maybe my potluck will get cake and pie…. You guys never cease to amaze me. Anyone who devotes the time to baking a pie during the week has earned my adoration :-) By the way, have you ever tried making a Ritz Cracker faux apple pie? I tried the Saveur recipe a few years ago but since it didn’t specify Meyer lemons, and since I didn’t have any lemons at all, I tried it with limes. No amount of sugar or macerating would have made it edible. Talk about holes burned in your mouth (or gut). My DH and I raced each other to the trashcan to see who could throw it out first. In my previous household I was the only citrus junkie so when I made this pie, doggone it, I had to eat it all. Couldn’t let it go to waste! I’ve recently become obsessed with lemons! This post is great :) I made a lemon sponge pudding the other day and it was so fun. A friend and I do small-party catering on the side, and one of our most popular desserts is a lemon blueberry tart. The crust is made with almond flour and almond extract and the filling has the juice and rind of about 4 lemons (!) whisked with sugar, eggs and cream. The best part of the tart are the handfuls of fresh blueberries that we scatter on top. After baking, we carmelize the top (like a brulee) and it has the most incredible zing of tart lemons mixed with sweet plump blueberries that you will ever taste. I’m a sucker for anything with lemons – I guess it’s a good thing that I have a humongous lemon tree in my backyard which now currently has about 75 ripe lemons ready to drop! I love lemon but have never tried the Meyer lemons. They rarely have lemon here in Peru, let alone other varieties. Sounds very tasty though! Red alert! Fairway has meyer lemons! It’s worth the trip for us Chelseaites, non? This is a favorite lemon recipe from my family (via my paternal grandmother). It’s simple and delicious, and not picky about the type of lemon! Combine the above, pour in a standard pie pan, and bake at 250 for 1 hour. combine in a double boiler to dissolve, then cool. 1/2 pt. heavy cream, whipped. I refuse to make/eat lemon meringue ever again, this is soooo much better! I just saw a recipe for this pie in Cook’s Illustrated! Interesting. I’ve had meyers lemons before and loved them but never thought to try them in a pie. My fiance and I recently made a lemon sorbet that was a bit to much for me so maybe meyer lemon would work better in that as well. I went to this famous produce store in MA last weekend. (Gave the website as my link.) They had THE LEMONS!!!!! I used my web browser on my Blackberry to see the number of lemons this recipe called for….2. Got them! Oh…..it was sooooo on. I made the pie last night. yum…..yum….yum….. I diced the lemons so thin, I was sad. They looked like an ugly mess. Halfway through I started smiling. Super thin = no rind = awesome texture. The lemons are lemons but not….does that make any sense? It’s like a really good lemon with a slightly different flavor. Still not making any sense? This pie turned out to be lemon squares to the nth degree. It is not for the weak at taste buds. If you L-O-V-E lemons like I do…..you should try this. I found it to be sooo good. Also, easiest pie I ever made. i just recently found your site and I LOVE IT!! seriously, it warms my heart to see the pictures and read the recipes and your experience with them. i am so happy that you have so many lemon recipes – i have a meyer lemon tree in my yard and half the lemons go bad each season because we can’t use them all – i’m going to make this recipe today!! There’s a pie shop here in San Francisco that has Shaker Lemon Pie on their regular menu – I’d never heard of it before! Thanks for sussing this recipe out! Since honey takes the bitter out. (My mother’s “trick” in rhubarb pies). This is one of my favorite pie recipes, but oddly the worst one I ever made was with Meyer lemons. They were tough and bitter, really unchewable almost. Those big ol’ milder sunkist lemons seem to work better for me as the rind is thick,spongy and porous enough to really absorb the sugar. I also recommend slicing paper thin with a fine serrated knife. The thinner the better and don’t forget some homemade french vanilla ice cream on the side; the definition of bitter sweet. Deb, I finally was able to make this over the weekend … with a little less sugar and butter and more meyer lemons, because I am not afraid of the lemon. What a special flavor! Wonderful, but so rich! Now I have to figure out what else to make with the box of meyer lemons I picked up at Fairway. hmmm. I tasted this pie at a party this summer, begged the guy who made it to tell me where the recipe was from. He benevolently directed me here, and I’ve been enjoying this blog ever since. Only yesterday did I finally decide to get myself together and MAKE this thing. It’s in the oven now. I decided to be kitschy and have some fun, so I rolled a thin snake out of the leftover pie dough and spelled out LEMON in cursive on the top. But is it really necessary to soak the lemons exactly 24 hours? I did mine (normal lemons, I didn’t have meyers) for around 20. I’ll let you know how it comes out. To think that earlier this year someone brought me a basket of Meyers and I didn’t know what to do with them and just let them shrivel! The pie was very good, rather more like curd than marmalade. I wish it’d had just a little more lemon sharpness…perhaps the butter dulled the flavour, or it was just the fruit I used. The rinds were a little tough, but not unpleasantly. And the whole thing was just so easy…. I’m going to try it with Meyer lemons the next chance I get and see if the flavour’s brighter, but as we all know, they are hard to come by and I would like to eat this pie more often than I can get Meyers. If you have any tips on how to make standard lemons taste sharper, I’d appreciate it. I want it so lemony that it hurts just a little to eat it…. I’ve been making this pie constantly, still with normal lemons. Everyone loves it. My only change has been to put the lemon-sugar mix through the food processor just before adding the other ingredients. Just to make the rind pieces a little less tough and big, and it makes a huge difference. Now I’m trying to figure out how to turn it into the perfect lemon-ginger pie…. I’ve been eating this pie weekly for several months. I really recommend throwing in some berries into the mix. Lemon-strawberry is the winner so far. I have lemon-blackberry in the oven. THANK YOU, SOOOO GOOOD. I FINALLY got hold of some meyers, and last night I made this again. I also added a little chopped rosemary. I wish I’d soaked it in the sugar, to help it come through better, but it only occurred to me as I assembled everything. The meyers were very good, but I like regular lemons in this, too. I love the berry idea, and hope to try that tomorrow! After you slice the lemons paper thin, squeeze out the juice into a separate bowl. Reserve the juice. BOIL the rind and pith in water for 5 minutes. Drain, let cool, add back in the juice. Proceed with the recipe directions. Boiling the pith and rind for 5 minutes eliminates the bitterness. But, don’t boil the juice! What happens if you do boil the juice? Also, I have to say I have always used a crisco-based crust but tried Deb’s butter crust for this and it was really, really good in taste and flakiness. Despite my fears, working with the butter wasn’t more difficult than the shortening. Is there a way to tell if Meyers are ripe? I’ve made this three time now and the first was the best. The filling was not bitter at all and the rinds were not chewy. The last two times, the pie turned out well but there was definitely bitterness and chewiness. The Meyers in your photos look quite orange whereas the ones I bought were definitely more lemon yellow. I would love to make this with really good Meyers next time. Unfortunately, they’re not easy to come by here in Vancouver. Oh yeah, in San Diego we get spoiled with all kinds of great produce and right now it’s citrus season. I can sometimes load up an entire plastic shopping bag with delicious organic fruit for $5 at my local farmers market. If you’re ever in need of some citrus fruit or any kind of weird and exotic bit of produce, let me know. I’m from the East Coast, I know what it’s like to have to settle for hard, mealy tomatoes and mangoes that taste like carrots. Ick. Just made this, with Meyers. I ended up adding an extra half of a lemon, and I feel that the overall effect was still too sweet. I think next time I’ll cut the sugar down by a half of a cup. No bitterness, though! Hey Deb! Just perusing some of your older posts and came across one of my favorite pies of all time! I can find Meyer lemons for about 1 week, here in MN, and when I do I buy boatloads. After a 2 weeks I juice the leftovers and freeze in 1/2 C pods for the rest of the year. That being said, I’ve never used Meyer Lemons for my Shaker Lemon Pie (as I tend to make it around Christmas time). 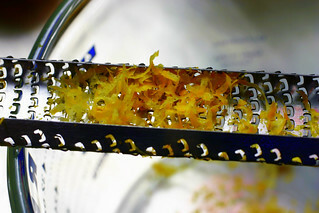 To combat the bitterness, I shave off a good portion of the lemon rinds then use the slicing blade of my food processor to get them nice and thin. Macerate no less than 24 hours. It’s the most intense, beautiful, non-bitter, non-sweet lemon pie you’ll ever set your mouth on. One of my standby pies. My recipe (well, Martha Stewart’s) is similar to yours but it uses 9 eggs. I just got back from the store and ran to my computer to tell you that I just found my first-ever batch of Meyer lemons. I’m so excited–it’s going to be a lemony couple of weeks. I’ve got a few recipes I’ve been saving from here until I could get my hands on the little guys…as always, thanks for the inspiration! Two thoughts about Shaker Lemon pie. First- Meyer Lemons are not the savior, just a different taste. Other lemons work really well. Second- after having made the Saveur version of this pie a couple dozen times over the years, my favorite approach is to not include the whole lemon. Instead I grate the zest off then slice the lemons in half and scoop out all the pulp and juice (a little extra work I admit….). This is mixed into the sugar and zest and left to sit overnight as the directions dictate. The pie is infinitely better made this way from the point of taste and texture. A pie crust of European style butter, the pie served with homemade whipped cream…… yum. what if you get really excited about making this pie and you have 2 meyer lemons sitting in your fridge and so you get everything ready and have the lemons sliced and sitting in sugar and then life happens and you don’t have a chance to bake the pie for 3 days? are the sugar lemons still ok?? they smell fine, i just can’t tell… help! Has anyone seen the Cook’s Country version??? They squeeze the juice out of the fresh lemon slices and then reserve the juice on the side. 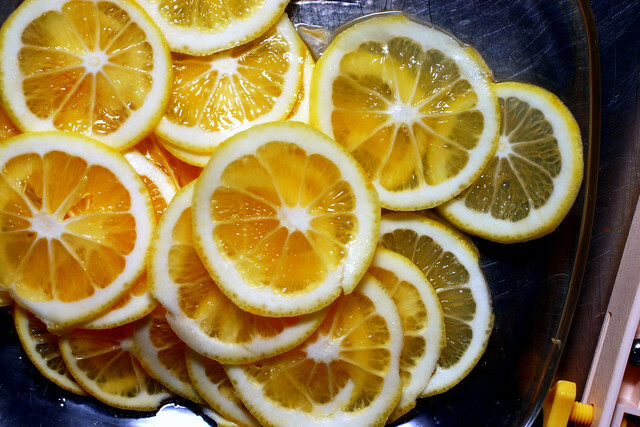 Then they cook the lemon slices and 1 1/2 C sugar for about 5 minutes to remove the bitterness…. They drain the cooked slices and then dump out the cooking liquid (which has all the bitterness). Then they combine the fresh juice with the cooked slices and the beaten eggs (which have an extra 1 tbsp of cornstarch in them as well). Then the whole shooting match goes into the pie crust and then the oven. Okay, so I made this over the weekend, and holy crap. Not sure what people are talking about with the bitterness – or maybe it’s just that my tastebuds are calibrated a bit differently, but I thought it was delightful. Not too sweet, not too tart, and not at all cloying. The only issue is that my husband, who is very picky about textures, doesn’t like the texture of this too much. Me, I love candied orange peel, so what amounts to candied lemon is a-ok for me. I think that the “bitterness” is the point of this pie. I love it. I have made this pie twice, and it is absolutely amazing. The first time I made it with regular lemons, and it was delicious but the filling was slightly course and difficult to chew. The second time I made it with meyer lemons (and a couple of strawberries), and although the texture is much better, it is slightly too sweet, so next time I make it with meyer lemons I will add less sugar. But don’t be afraid to try this pie with normal lemons! Two things: (1) your all-butter pie dough is an absolute dream; (2) this pie is THE thing for grownups who like their lemon with a little edge. We loved the texture of the candied lemon rings, although I might cut the lemon slices into half-moons next time to make the pie easier to eat. I found that the bitterness mellowed overnight in the fridge, so the next day the pie had that great floral Meyer lemon aroma with a good hit of sourness and just a tinge of bitterness. Do you have any pictures of the final product when cut? I’d love to see what it looks like on the inside! I am actually in the middle of attempting this recipe. How did you get your filling to curb/marmalade consistency without heating it? My filling was pretty soupy so I heated it slowly on the stovetop before pouring into the crust. We’ll see how it turns out. Did I miss a step somewhere? Thanks! I think it was a tad soupy and gel-ed after baking, as it cooled. Sugary pies usually do. I love lemon pie, and tweaked this recipe a bit to get a more creamy consistency. I used regular lemons and it turned out great. I grew up with my mother making Shaker lemon pies. Pretty early in her pie making days, she started chopping the lemons up in the blender to make the rind much easier to eat. These pies were always a hit at family gatherings. She never used Meyer lemons, and the pies still turned out great. I remember one time Mother decided to try the same recipe with limes. I think my uncle is still trying to pry his puckered mouth open some thirty years later! My late daughter and I are/were movie nerds, and one evening we talked about what kind of Lemon Pie Clint Eastwood and Hillary Swank were eating in the film “Million dollar baby”. We agreed that it probably was a shaker lemon pie. I sliced lemons and marinaded them in sugar the day before, and so Sara came to my house and we had a wonderfull evening together, baking the cake, and having a piece of it. We have no access to meyer lemons here in Denmark, so it was chewy but wonderfull anyway. The next day Sara was killed in a traffic accident, hit by a truck, dead on the spot, 24 years old. We served this pie after the funeral. It is now 8 months ago. I would really like to bake this pie every evening before the day she died, but in the future, with Meyer lemons, since we talked a lot about them that evening. But everytime I ask a greengrocer about Meyer Lemons, i get a blank stare in return. Ah well, I guess whatever lemons are available in late july will have to do. Well, late july it became here in sunny Denmark, and of the 6 organic (or so *they* claimed) lemons I bought for the pie, one of them was probably a Meyer. Round instead of pointed. Very thin, spongy white inbetween as opposed to thick and chrispy, as in ordinary lemons, I think I hit the spot! Added a spot of ginger for this years Meyer Lemon Pie. I just made this recipe with organic lemons and added some raw honey for some sugar like half cup,the best pie i ever made, the dough is really the best. I made this pie yesterday for a pie contest and it was delicious and I got an honorable mention! KQED wrote up the contest here: http://blogs.kqed.org/bayareabites/2011/08/29/5th-annual-mission-pie-contest/ (with pictures of my pie!). I couldn’t find any Meyers so I used regular (whatever those are) lemons, and the flavor was brighter but still delicious. It got eaten very quickly :-). I made this Shaker pie 2 times this week. This Pie is now on our faves list. thick skin cut most of it off. in a blender. This maks a smoother mix than you can ever thin slice the lemons. Sprikle cinnamon on the pie or on extra pie dough for a sweet treat. saw a cooking show yesterday featuring unique sweets and one gal made this pie and used Vodka as the fluid in the pastry. They claimed the vodka evaporated completely unlike water and made the perfect flaky crust top and bottom without the liquor flavor. I’m trying this one. One quicker way to make the pie is to squeeze out the juice then simmer the lemon slices for about 5 minutes and discard the water. That’ll leach out all the bitterness while saving the juice. I’m researching lemon pies of the not-meringue variety, and I came across this post. After reading of your Meyer Lemon-less troubles, I had to comment. I’m in the Chicago area, and I can never, ever find Meyer Lemons, either. This stressed me out so hard that a few years ago, I asked an old boyfriend to buy me a Meyer Lemon Tree starter for Christmas. Two-plus years later, the relationship is long gone, but my Meyer Lemon Tree is still kicking. It lives inside in the cold winter months, and outside during our short summers. So far, it’s yielded exactly 1 (one) rock-hard, inedible lemons, but it flowers a couple times a year, so I diligently water it. keep it in full sunlight, and use a cotton swab to cross pollinate those flowers, because as long as they keep budding, I’m confident than one day I’ll make lemonade from that tree! I finally found Meyer lemons in my grocery store, but they were quite small. Like smaller than your average lime. So I cut up the entire bag (which I think was 2lbs, 7 tiny lemons in all) because after cutting up 4 of the tiny lemons, it still didn’t look like very much lemon. Anyway it’s sitting on my counter right now, waiting to be assembled tomorrow. I guess I was just wondering if you could make any suggestion regarding the weight or volume of sliced lemon required? I may end up with too much filling, but better too much than too little, I think! I replaced the pie crust with a shortbread cookie crust (3/4C butter, 1/4C sugar, 2C flour) on this pie a few years ago, and this year I decided to make mini-tarts instead of one giant tart. They’re truly outstanding, and I want to make them for every party during Meyer lemon season. Thanks Deb, for giving us such wonderful inspiration! Robin -Weigh 2 regular lemons then use the equivalent weight of meyer lemons. Well I have a bumper crop of meyer lemons hanging in the backyard so I decided to try this pie recipe. No bitterness and the recipe works fine but its for all intents and puproses lemon meringue without the egg white topping. lose the crust and cook the filling on top of the stove and this becomes a simple and efficient recipe for brit style (meyer) lemon curd. I am a dissenter about the meyer lemons. I have made this pie both ways and though I love meyers for many uses, they are too wimpy for this pie. I use regular lemons and serve the pie warm with really good vanilla ice cream and it is perfect. Not sure about how it would work with the flesh of the fruit, but since meyer lemons are lemons crossed with oranges, that should work alright too. Very much looking forward to making this — waiting on my lemons-and-sugar. As a lover of all things lemon, and the owner of a heavily bearing (year-round) Meyer Lemon tree, I am always eager to learn new lemon recipes. I had a similar recipe many years ago but, sadly, lost it somewhere along the line. I’m glad to have it back, although I do recall using far more than two lemons…it may have been in the four or five lemon category. One can never have too much lemon! I used to be a baker at Shaker Village at Pleasant Hill in Kentucky and would make several of these pies daily. I’m sure the Meyer lemons are ideal, and I’d love to try the pie with them, but pies I made for the restaurant were always plain ole lemons. I realize that this recipe and post happened several years ago but I wanted to let everyone, including Deb, know that I found my Meyer Lemons this year (hear in Maryland at least) at my local Sams Club late spring/early summer. They were a FAIRLY decent price also. And just recently, surprise surprise, I found REAL Key Limes at Walmart. This must have been the pie-baking fairy godmother looking after me because I RARELY, if ever, shop at Walmart. But, I was desperate for something late at night and at least where I live they’re just about the only thing open very late at night. If this is made a day ahead will it be just as good? Sounds wonderful and I have a new crop of Meyer lemons! susan — Yes. It should keep well. Most pies are better on the second day, anyway. I found this recipe ten years ago in a magazine from the Indiana historical society, ut it out and stuck it away. After moving to Florida I dug it out and tried it with Sunkist Lemons. It was good but the pith was so tough you couldn’t cut it with a fork and took a very sharp knife to cut a slice. A lady I played cards with had a Meyer lemon tree and she gave me some and I tried it again and it was ambrosia. I bought a Meyer lemon tree and planted it outside my condo and has been very prolific. Ihave made it numerous time when the leons are in season and all my friends rave about it. A gift fro the Gods. Itried it again with the Sunkist lemons, only this time I grated off the zest and then pealed off the pith and sliced the lemons very thin and this turned out well, except there wasn’t the zest flaor like I got with the Meyer lemon. Trying this recipe for the first time tonight. Pie would have been made by now but the gas ran out :(. Hope its amazing :) thanks. The only difference between your recipe and the one given to my late aunt by a former shaker woman from the Pleasant Hill Colony of Shakers near Harrodsburg, KY is the butter. The butter was not melted but soft and was swirled through the mixture before pouring it into the pie shell. I have had the pie many times made with regular lemons, but the lemons must be the thin skinned type. Those are extremely difficult to find today. Meyer lemons do indeed work well in this recipe. The old-fashioned lemon is still my favorite. hi, i love this recipe and just tried it out. i’m now obsessed with meyer lemons!! thank you! the only issue i had was cutting a proper slice of pie. it got pretty messy as the pith was still a bit tough. the lemon slices were paper thin, and it tasted fantastically balanced between tart and sweet. any suggestions on easily slicing would be appreciated. I made two of these for Easter, since my meyer lemons are ripening on the tree. I forgot about the 24 hour mascerating time (just did 9 hours), and when it came time to eating, someone commented about the bitterness. I was disappointed, because I thought I failed. Apart from the bitterness, the lemon flavor was fantastic, like a really luscious lemon curd. My husband later had a piece and said the bitterness added character to the pie. I re-read this page, and now I see that the bitterness isn’t a bad thing. However, I can’t get my lemons to slice on the mandoline. They just shreds up, probably because I try to use ripe, softer lemons. So I resorted to slicing them as thinly as I could. Made this tonight and it was delicious! I really can’t think of any changes. I didn’t use meyer lemons, just regular (organic) ones, and I forgot to zest, so it was the WHOLE thing. The inside firmed up after I let it completely cool. Delicious! Just finishing off the last of the pie. I enjoyed, it was delicious. I’m to lazy to zest, just sliced the lemons (Not meyers) super thin. And followed directions other wise. I will make this again, but will chop the rind in pieces, I liked them but others didn’t. This is one of my favorite pies and I’ve made it with both kinds of lemons, much better with Meyers. I slice the lemons with a serrated knife. Every Smitten Kitchen recipe I’ve ever made has been delicious, but I can’t understand the need for zesting the lemons in this recipe, unless one were working with lemons with such thick tough peels they were difficult to slice otherwise. Using high quality free range eggs contributes to the beauty and deliciousness of this pie. I just made this pie while trapped in a snow storm. I only had regular lemons, but added a few orange slices and a teaspoon of vanilla extract to counter the increased bitterness. It worked wonderfully in a pinch and the pie tasted great! Is there a trick to getting lemons to slice on a mandoline? Mine just mangles them. Sengklat — Is yours older? I do find that after several years of use, mine get dull. That’s when the mangling happens. Made again this for the third or fourth time now, really easily with a Borner mandoline. So yummy! The pie, that is. Safety tip: don’t eat mandolines. To answer my own question, this time I used four small thin-skinned meyer lemons, total weight 280g. It was a brand new one. It’s been returned, since I got it mostly for this very recipe. A different brand is on order. I realize, now that I’ve read a near infinite number of mandoline reviews, that lemons are one of the most difficult things to cut. The ridiculous thing is that I drooled over this recipe for ages but didn’t make it due to lack of mandoline, and once I had a mandoline I ended up just cutting the lemons with a knife, and probably thinner than a mandoline could. Do you know what total weight of lemon one should use? I forgot to weigh my mangled lemon chunks before I threw them in. I made this yesterday….perfection. Do you need more Myers? I can’t go through the fruit on my tree fast enough. Thanks for yet another perfect recipe. You’re so good, I’m perfectly comfortable trying your recipes on company. Pie in the ’60s, not with Meyers, and never forgot how good it was with “ordinary” lemons. Meyers lemons makes it that much better–such fragrance! Glaze the top crust with egg white and sprinkle with white sugar. I don’t really get all the scrambling to eliminate the bitterness … it’s the combination of bitter/tart/sweet that makes this pie. I understand refining and revising, but there’s also something that I really like about honoring a recipe such as this: an old and very simple one (honestly, the basics are the same everywhere: lemons, 2C sugar, 4 eggs, and a double pie crust). Made the pie tonight. Totally delicious. Needs whipped cream or ice cream to go with. Great pie for company: makes impressive, neat&tidy slices. Thanks Deb! I’m Confused about the zest in the recipe. Do you zest the lemons before you slice them? Do you zest part of them or zest additional lemons, if so how much? This time I left out the zesting, used an extra lemon and substituted tapioca for the flour used in thickening the filling. Pamela’s GF bread mix makes a great crust which I brushed with sweetened cream to aid browning. We had this with vanilla ice cream for dessert on Christmas, everyone enjoyed it. -My lemons were small, so I used three instead of 2 large. Mistake. -The recipe said to macerate for 24 hours; another online recipe said at least 4. Mine sat for 6. Mistake. -If I ever make it again, I will not only use Meyers but remove all the white rind. -Really good vanilla ice cream is an essential accompaniment. How should the inside of the pie look? I tried the recipe and the inside came out pretty dry, not sure what I did wrong, but might have left the pie in oven for a few mins too long at 425F. Any thoughts?? I used meyer lemons for this and actually found it TOO sweet, surprisingly. I don’t have a mandoline, so I zested my lemons with a microplane, then cut them in half lengthwise and cut them as thin as possible before following the recipe exactly and using my go-to flaky pie crust recipe from the Metropolitan Bakery Cookbook. The texture was great, though, and I’m going to try again with regular lemons. My meyers were also on the smaller side. I think I might also start weighing my lemons for future iterations of this pie, to see if that makes a difference. Made this yesterday. Rave reviews. I used three regular lemons and went 24 hours. I will certainly be making this again. Thank you once again, Deb! can I freeze it to serve later? Can I prepare the dough and lemon mixture in advance and assemble it the day I want to use it? rachel — Shouldn’t be an issue. I made a Shaker Lemon Pie decades ago and loved it. Of course, I couldn’t find my copy of the recipe, so I used the first one that came up on Google. I made it today and it was an epic fail. So, I went back to Google, and read the rest of the recipes. Not one of the recipes I found tells you what to do with all the juice that resuls from maceration th the lemons in sugar. I added it to the egg mixture, but then I ended up with about two cups of watery egg mixture after I covered the sliced lemons in the pie pan. What am I supposed to do with all the sugary juice? what a great recipe! i increased pastry and filling for a 10″. add a lemon to the filling, but no extra sugar – meyers are sweet enough. increase filling 25%. baking time at 350 goes up to 40 min. wish i could post a pic for you. thanks for this winter treat. happy new year! I just tried making my first Shaker lemon tart and I have my own Meyer tree (since I live in Houston). The filling didn’t set as well as I would like, so I’m wondering if the problem was that my homegrown lemons were much larger than the typical grocery store lemons and were overwhelmed by the binding capacity of the 1 Tbsp of flour in the recipe I used (versus your 3 Tbsp). Many of these chess pie recipes seem to need to have some chill time in the refrigerator to get to the desired consistency and my Pie Day 2016 party didn’t leave me enough time to prebake the day before due to the need for the 8-hour maceration. Smaller lemons might also have balanced the sweet to tart ratio a little better. I need to weigh a typical grocery store lemon to get a feel for the difference in size from the ones off my tree. I used to work as a pastry chef on Vancouver Island and made lots of shaker lemon pies at the cafe. Our recipe used a purée of lemons and sugar (done in the food processor), then we whisk in the eggs. We also used a cream pastry, which provided a great contrast to the tart lemon filling. 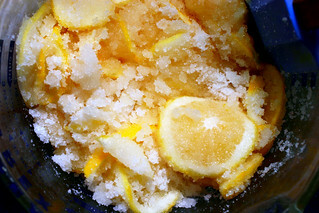 Meyer lemons are the best (which is one of the benefits of living in Australia), but regularly lemons are fine, as long as you soak and scrub them well; it removes some of the bitterness in the skin . We used to soak the lemons in boiling water for about 10 minutes and scrub them well with a pot scrubber; getting rid of any chemicals in the skin makes a big difference – or use organic ones. I am missing something – the actual recipe for Shaker Lemon Pie. I needed a lemon pie for a photo so tried this using Meyer lemons from my garden. It looks wonderful but, for my taste, is far too sweet. I find that often American recipes are too sweet for us so perhaps I’d be better to use regular lemons or cut the sugar in half for my next attempt. It’s definitely worth another try! Use regular lemons!!! Meyers would be way too sweet for this pie. It’s designed for full-tart lemons. I picked up a bag of meyer lemons the other day with no plans of what to do with them. First place I looked for inspiration was of course smitten kitchen (where else?). I tried to use a mandoline to slice but it was a fail, it gave me shards of peel with mushed pulp. This might work if they were frozen like another commenter suggested. I had no issues slicing the lemons very thinly with my sharp chef’s knife. I left the lemon/sugar mixture to sit for more than 24 hours just due to schedule and it was great, maybe even better. I really enjoyed this pie, as a huge lemon merengue pie and lemon bar lover this really was a winner for me. Just a touch of bitterness but in a very good way. Very good, but I did not find it very lemon-y, and I even added an extra lemon! I used meyer lemons. I’m thinking I would reduce the sugar a bit next time, but I’m worried then the pie would be bitter rather than just less sweet. Or perhaps adding fresh lemon juice right before putting the mixture in the shell? Deb: would there be a good way to retain the tartness and lemon-factor without bringing on more bitterness? Suggestions? OMG, I’m lucky enough to have my own Meyer Lemon tree and enough lemons to share with many. I have 3 gal. of lemon juice cubes, 1 gal. preserved lemons preserving, 1 gal. of limoncello getting drunk, a couple of lemon pound cakes, a wonderful thinly sliced lemon and thinly sliced ginger with raw honey poured over for colds or to sip every day, 1 qt. thin half slices frozen for martinis BUT this Shaker pie recipe is my favorite of all times and I am a LOVER of lemon meringue pie, lemon bars and lemon curd just to snack on. I am making my 3rd one tonight and sliced the remaining lemons to freeze without the sugar and hope it will make still another pie. Would this need modifications to do without the top crust? I prefer Shaker Lemon Pie with no top crust but trust Smitten Kitchen way more than the other cooking blog recipes I can find! Any advice? You wouldn’t happen to have a recipe for lemon meringue pie, or just a recommendation to a good one?